Filtering of manual dip data to extract indicators of the palaeohorizontal during deposition. Display of such data on tadpole plots, azimuth plots and rose histograms. Vector analysis (including azimuth walkouts and cumulative dip magnitude plots) to identify orientation changes between structural zones. Stereographical analysis of filtered bedding data by zone to generate representative structural dips defining post-depositional (generally tectonic) rotation. 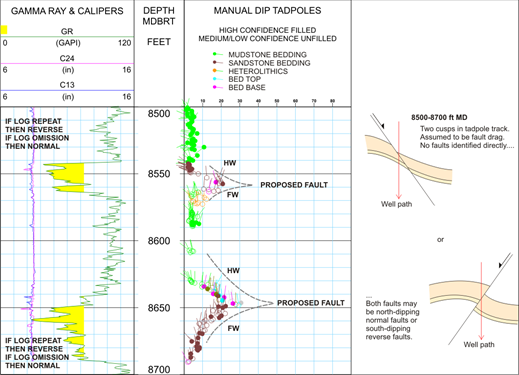 Identification of probable faults by direct observation, bedding drag and fractures (damage zones). Presentation of fracture and fault data by type as stereoplots. Examination and interpretation of structural zone boundaries into e.g. unconformities, faults, palaeohorizontal changes.